Men's Domed Two Tone Wedding Ring : LOVE2HAVE in the UK! 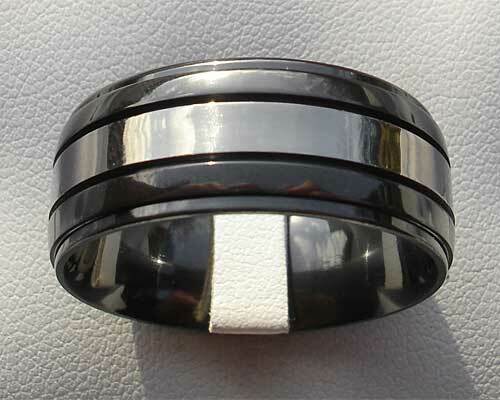 A shoulder cut domed two-tone men's wedding ring. Our two-tone zirconium rings make an excellent choice for your men's wedding rings too as they are designed to last and will remind you of your wedding day and your commitment to one another. This ring is made from zirconium, the perfect choice of metal for creating two tone wedding rings, and none more so than this beautiful example featured here for men. It has s shoulder cut profile with a slight domed style shaping and cut into the ring are two perfectly machined grooves or slots. The slots sit either side of the natural grey and are cut quite thick which emphasises the two-tone effect significantly. The remainder of the ring is black including the shoulders. 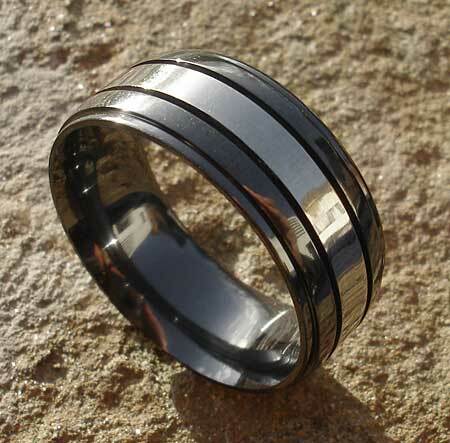 The widths available range all the way from 6mm to 12mm, so why we list this ring in the men's wedding ring section, women may want to consider this design style too. Finally, you have a choice of either a polished or a satin finish.